Unless you’ve been living under one of those proverbial rocks you can’t possibly have missed Andy Murray winning Wimbledon on Sunday. Being a patriotic Brit (or perhaps just sensing a marketing opportunity?) Franco, owner of SoLita decided to commemorate this momentous event with a special tribute burger. 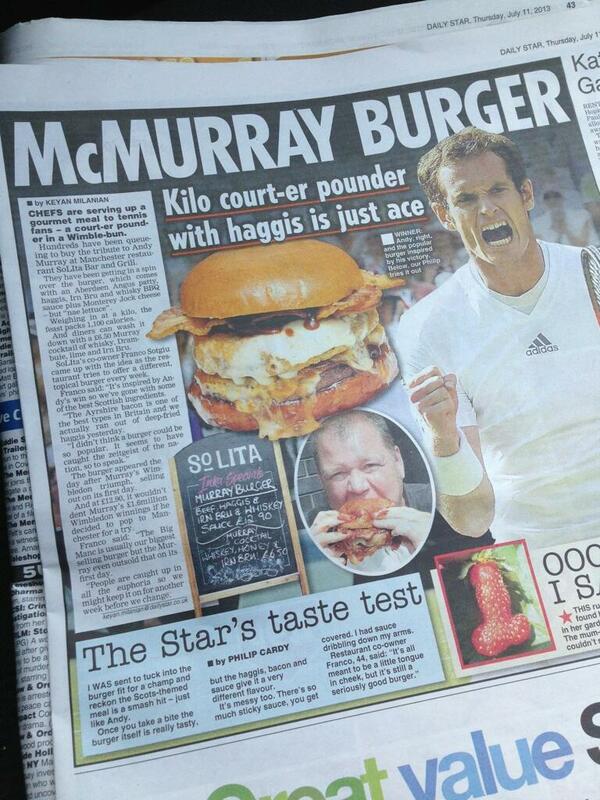 Since it’s launch on Monday ‘The Murray’ burger has been attracting almost as much attention as Andy’s win. It started off with local news but over the last couple of days it’s been featured on EuroSport, talkSPORT radio and several national newspapers including the Daily Express and a full page spread in the Daily Star! 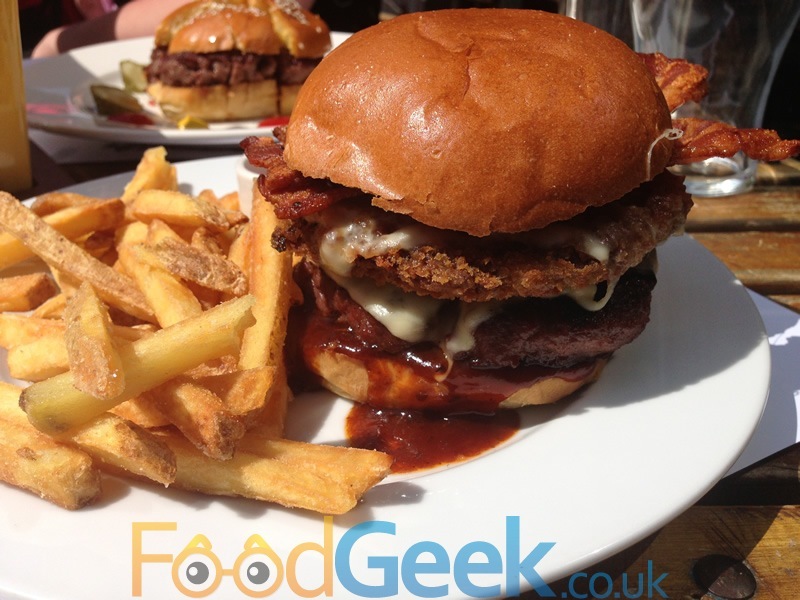 Having already eaten at SoLita 3 times in the last 10 days I wasn’t due another visit but this burger is not only topical but strictly limited and due to end at the weekend. I’ve eaten most of SoLita’s specials and just couldn’t miss this one. The Murray Burger is a fascinating concoction of Scottish stereotypes in a bun. It also looks and tastes amazing. Featuring an Aberdeen Angus beef patty, panko coated, deep fried haggis, Ayrshire bacon, lashings of melted Monterey Jock (not a typo!) cheese with an Irn Bru & Whiskey sauce and ‘nae lettuce’ (I have a chuckle about that every time I see it). It could only be bettered if it was served with a side of deep fried bitesize Mars bars. Biting into it I first thought that whilst the whisky & Irn Bru sauce is interesting and very tasty it was a little too sweet for me. 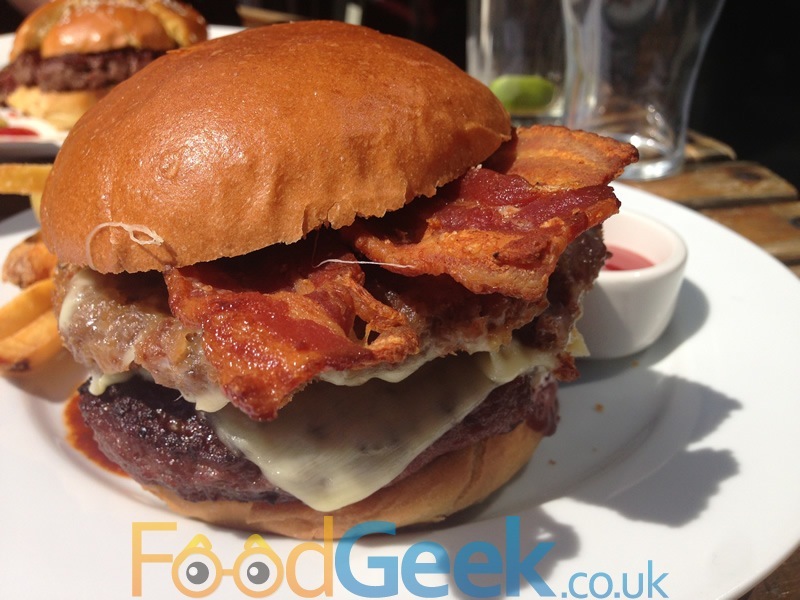 However, the savouriness of the cheese, haggis and particularly the stunningly crispy bacon balanced it perfectly. It’s up there with the Life Aquatic and Manc-Hatten as one of the best SoLita burgers i’ve ever eaten. Of course I couldn’t go to SoLita and eat just one burger. Particularly not when they’ve just launched another exciting special. 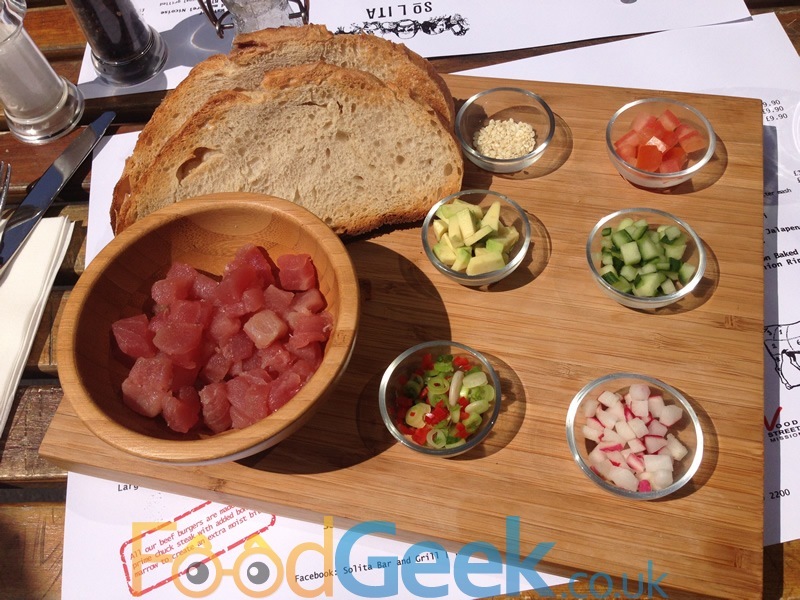 Having loved the ‘DIY Steak Tartare’ so much on a previous visit I couldn’t wait to try the tuna version. The ‘DIY Tuna Tartare’ is served in the same custom made platters as the steak version. The large bowl contains sashimi grade tuna, the smaller bowls; radish, avocado, chilli & spring onions, cucumber, tomato & sesame seeds with a wedge of lime and a lemon & olive oil dressing. Just like last time I threw everything in, gave it a quick mix and spread it onto the toast. The taste was out of this world. 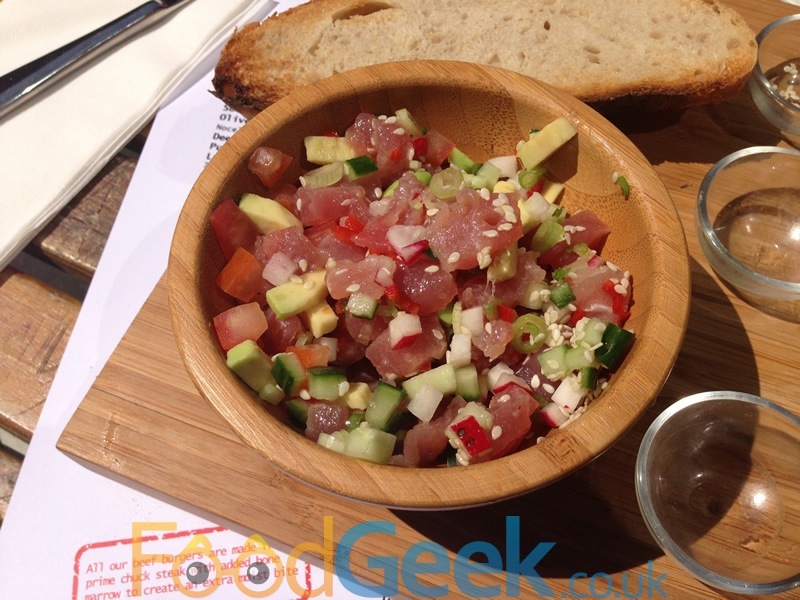 If I have one minor critique i’d like the chilli to be hotter but otherwise it was stunning, the tuna top quality and the other flavours combined so well together, especially the avocado. It was absolutely perfect for outdoor eating in the amazing weather. Not content with having the worlds most popular burger on the menu SoLita are about to launch another special which is possibly their craziest yet! And yes, that includes Pulled Pork Sundae, Deep Fried Coke and Bacon Candy! ‘Burger Fondue’ is as nuts as it sounds but it’s brilliant fun! It’s essentially a regular burger cut into pieces served with a pot of piping hot cheese sauce and fondue forks for dipping. I’m not going to lie, I didn’t think this dish would be for me but somehow it just works. The cheese sauce is rich, cheesy and delicious with a good hit of mustard and Kirsch. 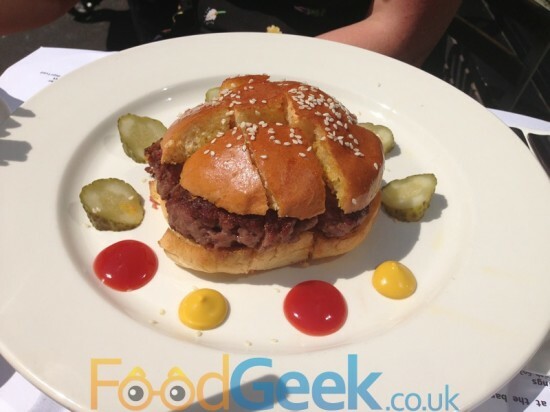 Dunking the burger and pickles into it is great fun and i’ve never seen anything like it before. I probably wouldn’t order it again for myself but I can imagine it going down very well for large groups of diners at weekends. 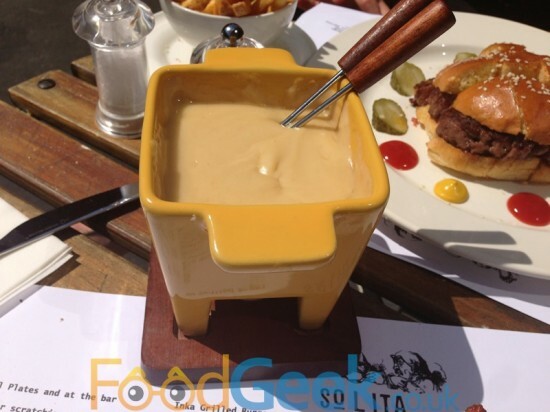 I didn’t pay for the Burger Fondue as it hadn’t officially launched yet and Franco offered me a preview. As usual, this doesn’t change my opinion in any way. I mean it’s a burger dunked in melted cheese, what’s not to love? With the weather being so unbelievably good today I finally got to sample the famous SoLita ‘terrace’ too. I very much enjoyed the view. With the forecast good all weekend I suggest you go and get yourself a Murray burger while you can and grab a space on the terrace. Previous: Teppanyaki Manchester, Surely It Can’t Be As Bad As Sapporo? 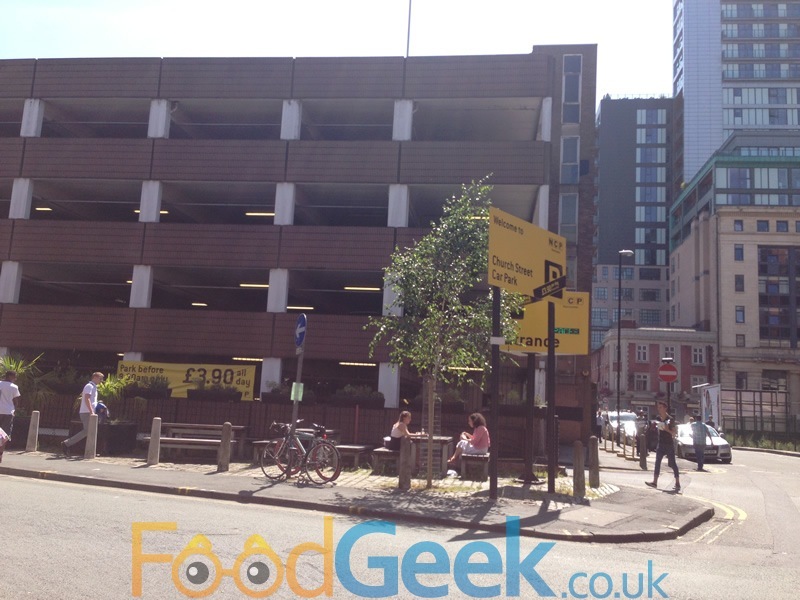 Next: Damson, MediaCity – Quality Fine Dining In Salford! Franco`s a legend….constantly creating new treats.I`m overdue a visit…well overdue.